Sunnyvale, California – November 8, 2011: Vitria Technology, Inc. announces the release of the Vitria Operational Intelligence Solution for Process Visibility. Built on the M3O Operational Intelligence Suite, the Operational Intelligence Solution for Process Visibility makes it possible for enterprises to monitor the progress of strategic initiatives by providing real-time visibility into critical business processes that impact customer experience, operating costs, service level agreements (SLAs), and key performance indicators (KPIs). Scalable businesses depend on repeatable and measurable business processes. Most business processes interact with a variety of enterprise software applications and silos, such as ERP and CRM systems. Unless implemented by a BPM Suite, these processes tend to provide little or no visibility into internal operations and status. Even more so, such “hidden processes” can conceal broken processes or process exceptions that result in costly SLA violations and negatively impact business performance. Of particular importance to most companies are customer-facing processes, such as customer enrollment, order-to-cash, and service activation as well as the early detection of process exceptions where errors can lead to customer churn and reduced revenue. Operational Intelligence (OI) is an emerging form of real-time analytics that enables real-time visibility into core business processes. Operational Intelligence can link changes in process status to impact strategic initiatives, such as compliance management, SLA enforcement, and customer satisfaction. For business operations and IT teams, OI provides real-time visibility into business processes by identifying process exceptions not otherwise detected by “silo” management reports and reporting systems. For CIOs and executive leadership teams, OI enables enterprises to define and continuously monitor KPIs and SLAs, in real-time. Vitria’s Operational Intelligence Solution for Process Visibility provides a complete view of business processes, including hidden processes, across existing applications and solutions. 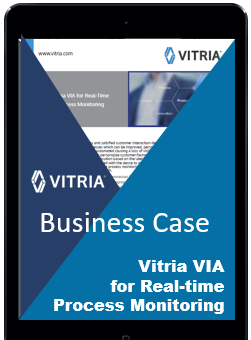 Vitria’s Operational Intelligence Solution will then correlate these processes back to business transactions and customer information, providing a context for line of business leaders to make better decisions. By shedding light on hidden processes, Vitria’s Operational Intelligence Solution has helped to increase customer retention, improve workforce utilization, reduce SLA infractions, and avoid regulatory compliance penalties. Vitria’s M3O Operational Intelligence Suite can be added without disrupting existing applications and processes and without introducing new risks into legacy business processes. The Vitria Operational Intelligence for Process Visibility Solution and the M3O Operational Intelligence Suite are available on premise or in the Cloud. To request a demonstration of Vitria Operational Intelligence for Process Visibility, please contact info@vitria.com. Sendero Business Services is a management consulting company based in Dallas, Texas with deep experience developing technology, strategy, process and human performance solutions across multiple industries.